There's a lot of risk in the market, and it's not where you think it is. As 2017 begins, investors aren't sure what to expect from the stock market. After eight years of impressive gains, many investors are worried that stocks might be overdue for a major bear market that could take away a huge portion of the profits they've reaped since the 2008 financial crisis. Yet one place where investors are largely ignoring risk is in a completely different part of their portfolio -- a part that most see as having little or no risk at all. If there's one investing mistake you absolutely cannot afford to make in 2017, it's assuming your investments in bonds are rock-solid and unable to lose money. Depending on how you invest in bonds, they could actually be the riskiest part of your portfolio right now. Most investors don't recognize the potential risks involved in owning bonds. That's largely due to the fact that modern portfolio theory encourages stock investors to own bonds in order to reduce the overall risk in their investment portfolios. Stocks are seen as having tremendous volatility, while bonds don't fluctuate as much based on business conditions. Moreover, at many critical times, bonds and stocks have moved in opposite directions, helping to reduce overall portfolio volatility. In particular, Treasury bonds are often referred to as being a risk-free asset. It's true that with the backing of the full faith and credit of the U.S. government, the default risk involved with owning Treasury bonds is negligible. Yet Treasury bonds have plenty of other risks associated with them, and investors need to be particularly aware of the impact that rising rates would have on their bond holdings. The other reason why investors don't fully appreciate the risk of owning bonds is that the bond market has gone through nearly 40 years of generally falling interest rates. Although short-time spikes have occurred, the overall trend has taken 30-year bond rates from the mid-teens during the late 1970s and early 1980s all the way down to their current level of around 3%. The decline in rates has reduced the amount of income that bonds have generated, but for those who own bonds through mutual funds and exchange-traded funds, falling rates have pushed prices higher, creating large capital gains that have made up a substantial portion of bonds' total return for years. However, many bond-market participants are increasingly concerned that an eventual end to the long-term bull market in bonds could hurt investors. As an example, just look at what has happened to bonds in the past few months. 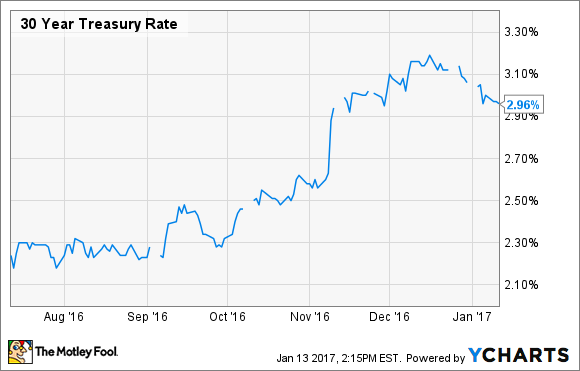 Interest rates on the 30-year Treasury bond have risen from around 2.25% in late September to as much as 3.2% in mid-December. 30 Year Treasury Rate data by YCharts. That single percentage point increase doesn't necessarily look all that troublesome. However, investors in the iShares 20+ Year Treasury Bond ETF (NASDAQ:TLT) experienced huge losses in the value of their holdings, which fell more than 15% over the same time period. Even those who were invested in intermediate-term bond ETFs with less exposure to interest rate movements saw their holdings decline 7% to 8% in value. As with most investing challenges, the answer isn't to panic or to give up. Instead, deal with the risk of bonds by gaining a deeper understanding of the bond market. In particular, it's useful to realize that the bond market has different areas in which you can diversify. Much of the recent damage has been done to Treasury bonds, but corporate bonds have fared much better. In fact, the high-yield sector of the bond market has actually produced positive returns, in part because investors perceive the economy as being more favorable to future growth. Some portions of the bond market trade more in line with stocks, rather than responding to movements in interest rates. Finally, cutting overall bond exposure is worth considering, but only if you fully understand what you'll do with that investment capital instead. Some have used cash investments to replace bonds, accepting slightly lower rates in exchange for the flexibility of having liquid assets ready for immediate deployment in the future. Others have boosted their stock allocations, with the adverse impact of potentially leaving them more exposed to stock market risk. Different investors will have different risk tolerances, making the best decision vary from investor to investor. Many see bonds as being risk-free, but they're not. Don't make the mistake of thinking your bonds can't fall in value. That way, 2017 won't deliver any nasty surprises if interest rates continue their recent climb.